For the rock band, see Indian Ocean (band). A 1658 naval map by Janssonius depicting the Indian Ocean, India and Arabia. The Indian Ocean is named after India. Called the Sindhu Mahasagara or the great sea of the Sindhu by the Ancient Indians, this ocean has been variously called Hindu Ocean, Indic Ocean, etc. in various languages. The Indian Ocean was also known earlier as the Eastern Ocean. The term was still in use during the mid-18th century. In Ancient Greek geography the region of the Indian Ocean known to them was called the Erythraean Sea. The borders of the Indian Ocean, as delineated by the International Hydrographic Organization in 1953 included the Southern Ocean but not the marginal seas along the northern rim, but in 2000 the IHO delimited the Southern Ocean separately, which removed waters south of 60°S from the Indian Ocean, but included the northern marginal seas. Meridionally, the Indian Ocean is delimited from the Atlantic Ocean by the 20° east meridian, running south from Cape Agulhas, and from the Pacific Ocean by the meridian of 146°49'E, running south from the southernmost point of Tasmania. The northernmost extent of the Indian Ocean (including marginal seas) is approximately 30° north in the Persian Gulf. The Indian Ocean covers 70,560,000 km2 (27,240,000 sq mi), including the Red Sea and the Persian Gulf but excluding the Southern Ocean, or 19.5% of the world's oceans; its volume is 264,000,000 km3 (63,000,000 cu mi) or 19.8% of the world's oceans' volume; it has an average depth of 3,741 m (12,274 ft) and a maximum depth of 7,906 m (25,938 ft). 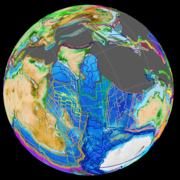 The ocean's continental shelves are narrow, averaging 200 kilometres (120 mi) in width. An exception is found off Australia's western coast, where the shelf width exceeds 1,000 kilometres (620 mi). The average depth of the ocean is 3,890 m (12,762 ft). Its deepest point is Sunda Trench at a depth of 7,450 m (24,442 ft); Diamantina Deep has a depth of 7,079 m (23,225 ft). North of 50° south latitude, 86% of the main basin is covered by pelagic sediments, of which more than half is globigerina ooze. The remaining 14% is layered with terrigenous sediments. Glacial outwash dominates the extreme southern latitudes. The major choke points include Bab el Mandeb, Strait of Hormuz, the Lombok Strait, the Strait of Malacca and the Palk Strait. Seas include the Gulf of Aden, Andaman Sea, Arabian Sea, Bay of Bengal, Great Australian Bight, Laccadive Sea, Gulf of Mannar, Mozambique Channel, Gulf of Oman, Persian Gulf, Red Sea and other tributary water bodies. The Indian Ocean is artificially connected to the Mediterranean Sea through the Suez Canal, which is accessible via the Red Sea. All of the Indian Ocean is in the Eastern Hemisphere and the centre of the Eastern Hemisphere, the 90th meridian east, passes through the Ninety East Ridge. During summer, warm continental masses draw moist air from the Indian Ocean hence producing heavy rainfall. The process is reversed during winter, resulting in dry conditions. Several features make the Indian Ocean unique. It constitutes the core of the large-scale Tropical Warm Pool which, when interacting with the atmosphere, affects the climate both regionally and globally. Asia blocks heat export and prevents the ventilation of the Indian Ocean thermocline. That continent also drives the Indian Ocean monsoon, the strongest on Earth, which causes large-scale seasonal variations in ocean currents, including the reversal of the Somali Current and Indian Monsoon Current. Because of the Indian Ocean Walker circulation there is no continuous equatorial easterlies. Upwelling occurs near the Horn of Africa and the Arabian Peninsula in the Northern Hemisphere and north of the trade winds in the Southern Hemisphere. The Indonesian Throughflow is a unique Equatorial connection to the Pacific. The climate north of the equator is affected by a monsoon climate. Strong north-east winds blow from October until April; from May until October south and west winds prevail. In the Arabian Sea the violent Monsoon brings rain to the Indian subcontinent. In the southern hemisphere, the winds are generally milder, but summer storms near Mauritius can be severe. When the monsoon winds change, cyclones sometimes strike the shores of the Arabian Sea and the Bay of Bengal. The Indian Ocean is the warmest ocean in the world. Long-term ocean temperature records show a rapid, continuous warming in the Indian Ocean, at about 0.7–1.2 °C (1.3–2.2 °F) during 1901–2012. Indian Ocean warming is the largest among the tropical oceans, and about 3 times faster than the warming observed in the Pacific. Research indicates that human induced greenhouse warming, and changes in the frequency and magnitude of El Niño events are a trigger to this strong warming in the Indian Ocean. South of the Equator (20-5°S) the Indian Ocean is gaining heat from June to October, during the austral winter, while it is losing heat from November to March, during the austral summer. The ocean's currents are mainly controlled by the monsoon. Two large gyres, one in the northern hemisphere flowing clockwise and one south of the equator moving anticlockwise (including the Agulhas Current and Agulhas Return Current), constitute the dominant flow pattern. During the winter monsoon (November–February), however, circulation is reversed north of 30°S and winds are weakened during winter and the transitional periods between the monsoons. Deep water circulation is controlled primarily by inflows from the Atlantic Ocean, the Red Sea, and Antarctic currents. North of 20° south latitude the minimum surface temperature is 22 °C (72 °F), exceeding 28 °C (82 °F) to the east. Southward of 40° south latitude, temperatures drop quickly. The Indian Ocean drainage basin covers 21,100,000 km2 (8,100,000 sq mi), virtually identical to that of the Pacific Ocean and half that of the Atlantic basin, or 30% of its ocean surface (compared to 15% for the Pacific). The Indian Ocean drainage basin is divided into roughly 800 individual basins, half that of the Pacific, of which 50% are located in Asia, 30% in Africa, and 20% in Australasia. The rivers of the Indian Ocean are shorter in average (740 km (460 mi)) than those the other major oceans. The largest rivers are (order 5) the Zambezi, Ganges-Brahmaputra, Indus, Jubba, and Murray rivers and (order 4) the Shatt al-Arab, Wadi Ad Dawasir (a dried out river system on the Arabian Peninsula) and Limpopo rivers. Precipitation and evaporation leads to salinity variation in all oceans, and in the Indian Ocean salinity variations are driven by: (1) river inflow mainly from the Bay of Bengal, (2) fresher water from the Indonesian Throughflow; and (3) saltier water from the Red Sea and Persian Gulf. Surface water salinity ranges from 32 to 37 parts per 1000, the highest occurring in the Arabian Sea and in a belt between southern Africa and south-western Australia. Pack ice and icebergs are found throughout the year south of about 65° south latitude. The average northern limit of icebergs is 45° south latitude. Left: The oldest ocean floor of the Indian Ocean formed c. 150 Ma when the Indian Subcontinent and Madagascar broke-up from Africa. Right: The India–Asia collision c. 40 Ma completed the closure of the Tethys Ocean (grey areas north of India). Geologically, the Indian Ocean is the ocean floor that opened up south of India. As the youngest of the major oceans, the Indian Ocean has active spreading ridges that are part of the worldwide system of mid-ocean ridges. In the Indian Ocean these spreading ridges meet at the Rodrigues Triple Point with the Central Indian Ridge, including the Carlsberg Ridge, separating the African Plate from the Indian Plate; the Southwest Indian Ridge separating the African Plate from the Antarctic Plate; and the Southeast Indian Ridge separating the Australian Plate from the Antarctic Plate. The Central Indian Ridge is intercepted by the Owen Fracture Zone. There are only two trenches in the Indian Ocean: the 6,000 km (3,700 mi)-long Java Trench between Java and the Sunda Trench and the 900 km (560 mi)-long Makran Trench south of Iran and Pakistan. A series of ridges and seamount chains produced by hotspots pass over the Indian Ocean. The Réunion hotspot (active 70–40 million years ago) connects Réunion and the Mascarene Plateau to the Chagos-Laccadive Ridge and the Deccan Traps in north-western India; the Kerguelen hotspot (100–35 million years ago) connects the Kerguelen Islands and Kerguelen Plateau to the Ninety East Ridge and the Rajmahal Traps in north-eastern India; the Marion hotspot (100–70 million years ago) possibly connects Prince Edward Islands to the Eighty Five East Ridge. These hotspot tracks have been broken by the still active spreading ridges mentioned above. The opening of the Indian Ocean began c. 156 Ma when Africa separated from East Gondwana. 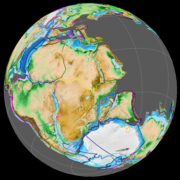 The Indian Subcontinent began to separate from Australia-Antarctica 135-125 Ma and as the Tethys Ocean north of India began to close 118-84 Ma the Indian Ocean opened behind it. Among the tropical oceans, the western Indian Ocean hosts one of the largest concentration of phytoplankton blooms in summer, due to the strong monsoon winds. The monsoonal wind forcing leads to a strong coastal and open ocean upwelling, which introduces nutrients into the upper zones where sufficient light is available for photosynthesis and phytoplankton production. These phytoplankton blooms support the marine ecosystem, as the base of the marine food web, and eventually the larger fish species. The Indian Ocean accounts for the second largest share of the most economically valuable tuna catch. Its fish are of great and growing importance to the bordering countries for domestic consumption and export. Fishing fleets from Russia, Japan, South Korea, and Taiwan also exploit the Indian Ocean, mainly for shrimp and tuna. Research indicates that increasing ocean temperatures are taking a toll on the marine ecosystem. A study on the phytoplankton changes in the Indian Ocean indicates a decline of up to 20% in the marine phytoplankton in the Indian Ocean, during the past six decades. The tuna catch rates have also declined abruptly during the past half century, mostly due to increased industrial fisheries, with the ocean warming adding further stress to the fish species. Endangered marine species include the dugong, seals, turtles, and whales. An Indian Ocean garbage patch was discovered in 2010 covering at least 5 million square kilometres (1.9 million square miles). Riding the southern Indian Ocean Gyre, this vortex of plastic garbage constantly circulates the ocean from Australia to Africa, down the Mozambique Channel, and back to Australia in a period of six years, except for debris that get indefinitely stuck in the centre of the gyre. The garbage patch in the Indian Ocean will, according to a 2012 study, decrease in size after several decades to vanish completely over centuries. Over several millennia, however, the global system of garbage patches will accumulate in the North Pacific. In 2016 six new animal species were identified at hydrothermal vents in the Southwest Indian Ridge: a "Hoff" crab, a "giant peltospirid" snail, a whelk-like snail, a limpet, a scaleworm and a polychaete worm. Human culture spread early on the shores of the Indian Ocean and was always linked to the cultures of the Mediterranean and Persian Gulf. Before c. 2000 BCE, however, cultures on its shores were only loosely tied to each other; bronze, for example, was developed in Mesopotamia 5000–3500 BCE but remained uncommon in Egypt before 800 BCE. The history of the Indian Ocean is marked by maritime trade; cultural and commercial exchange probably date back at least seven thousand years. During this period, independent, short-distance oversea communications along its littoral margins have evolved into an all-embracing network. The début of this network was not the achievement of a centralised or advanced civilisation but of local and regional exchange in the Persian Gulf, the Red Sea, and Arabian Sea. Sherds of Ubaid (2500–500 BCE) pottery have been found in the western Gulf at Dilmun, present-day Bahrain; traces of exchange between this trading centre and Mesopotamia. The Sumerians traded grain, pottery, and bitumen (used for reed boats) for copper, stone, timber, tin, dates, onions, and pearls. Coast-bound vessels transported goods between the Indus Valley Civilisation (2600–1900 BCE) in the Indian subcontinent (modern-day Pakistan and Northwest India) and the Persian Gulf and Egypt. Periplus of the Erythraean Sea, an Alexandrian guide to the world beyond the Red Sea — including Africa and India — from the first century CE, not only gives insights into trade in the region but also shows that Roman and Greek sailors had already gained knowledge about the monsoon winds. The contemporaneous settlement of Madagascar by Austronesian sailors shows that the littoral margins of the Indian Ocean were being both well-populated and regularly traversed at least by this time. Albeit the monsoon must have been common knowledge in the Indian Ocean for centuries. The world's earliest civilizations in Mesopotamia (beginning with Sumer), ancient Egypt, and the Indian subcontinent (beginning with the Indus Valley civilization), which began along the valleys of the Tigris-Euphrates, Nile and Indus rivers respectively, all developed around the Indian Ocean. Civilizations soon arose in Persia (beginning with Elam) and later in Southeast Asia (beginning with Funan). During Egypt's first dynasty (c. 3000 BCE), sailors were sent out onto its waters, journeying to Punt, thought to be part of present-day Somalia. Returning ships brought gold and slaves. The earliest known maritime trade between Mesopotamia and the Indus Valley (c. 2500 BCE) was conducted along the Indian Ocean. Phoenicians of the late 3rd millennium BCE may have entered the area, but no settlements resulted. The Indian Ocean's relatively calmer waters opened the areas bordering it to trade earlier than the Atlantic or Pacific oceans. The powerful monsoons also meant ships could easily sail west early in the season, then wait a few months and return eastwards. This allowed ancient Indonesian peoples to cross the Indian Ocean to settle in Madagascar around 1 CE. The economically important Silk Road was blocked from Europe by the Ottoman Empire in c. 1453 with the fall of the Byzantine Empire. This spurred exploration, and a new sea route around Africa was found, triggering the Age of Discovery. In the 2nd or 1st century BCE, Eudoxus of Cyzicus was the first Greek to cross the Indian Ocean. The probably fictitious sailor Hippalus is said to have learnt the direct route from Arabia to India around this time. During the 1st and 2nd centuries AD intensive trade relations developed between Roman Egypt and the Tamil kingdoms of the Cheras, Cholas and Pandyas in Southern India. Like the Indonesian peoples above, the western sailors used the monsoon to cross the ocean. 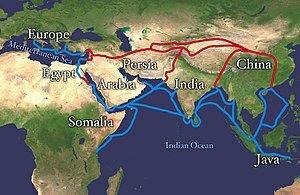 The unknown author of the Periplus of the Erythraean Sea describes this route, as well as the commodities that were traded along various commercial ports on the coasts of the Horn of Africa and India circa 1 CE. Among these trading settlements were Mosylon and Opone on the Red Sea littoral. Unlike the Pacific Ocean where the civilization of the Polynesians reached most of the far flung islands and atolls and populated them, almost all the islands, archipelagos and atolls of the Indian Ocean were uninhabited until colonial times. Although there were numerous ancient civilizations in the coastal states of Asia and parts of Africa, the Maldives were the only island group in the Central Indian Ocean region where an ancient civilization flourished. Maldivian ships used the Indian Monsoon Current to travel to the nearby coasts. The Rub' al Khali desert isolates the southern parts of the Arabic Peninsula and the Indian Ocean from the Arabic world. This encouraged the development of maritime trade in the region linking the Red Sea and the Persian Gulf to East Africa and India. The monsoon (from mawsim, the Arabic word for season), however, was used by sailors long before being "discovered" by Hippalus in the 1st century. Indian wood have been found in Sumerian cities, there is evidence of Akkad coastal trade in the region, and contacts between India and the Red Sea dates back to the 2300 B.C.. The archipelagoes of the central Indian Ocean, the Laccadive and Maldive islands, were probably populated during in the 2nd century B.C. from the Indian mainland. They appear in written history in the account of merchant Sulaiman al-Tajir in the 9th century but the treacherous reefs of the islands were most likely cursed by the sailors of Aden long before the islands were even settled. Arabic missionaries and merchants began to spread Islam along the western shores of the Indian Ocean from the 8th century, if not earlier. A Swahili stone mosque dating to the 8th-15th centuries have been found in Shanga, Kenya. Trade across the Indian Ocean gradually introduced Arabic script and rice as a staple in Eastern Africa. From 1405 to 1433 admiral Zheng He said to have led large fleets of the Ming Dynasty on several treasure voyages through the Indian Ocean, ultimately reaching the coastal countries of East Africa. In 1497 Portuguese navigator Vasco da Gama rounded the Cape of Good Hope and became the first European to sail to India (with the help of an Indian sailor) and later the Far East. The European ships, armed with heavy cannon, quickly dominated trade. Portugal achieved pre-eminence by setting up forts at the important straits and ports. Their hegemony along the coasts of Africa and Asia lasted until the mid 17th century. Later, the Portuguese were challenged by other European powers. The Dutch East India Company (1602–1798) sought control of trade with the East across the Indian Ocean. France and Britain established trade companies for the area. From 1565 Spain established a major trading operation with the Manila Galleons in the Philippines and the Pacific. Spanish trading ships purposely avoided the Indian Ocean, following the Treaty of Tordesillas with Portugal. By 1815, Britain became the principal power in the Indian Ocean. The opening of the Suez Canal in 1869 revived European interest in the East, but no nation was successful in establishing trade dominance. Since World War II the United Kingdom was forced to withdraw from the area, to be replaced by India, the USSR, and the United States. The last two tried to establish hegemony by negotiating for naval base sites. Developing countries bordering the ocean, however, seek to have it made a "zone of peace" so that they may use its shipping lanes freely. The United Kingdom and United States maintain a military base on Diego Garcia atoll in the middle of the Indian Ocean. On 26 December 2004 fourteen countries around the Indian Ocean were hit by a wave of tsunamis caused by the 2004 Indian Ocean earthquake. The waves radiated across the ocean at speeds exceeding 500 km/h (310 mph), reached up to 20 m (66 ft) in height, and resulted in an estimated 236,000 death. In the late 2000s the ocean evolved into a hub of pirate activity. By 2013, attacks off the Horn region's coast had steadily declined due to active private security and international navy patrols, especially by the Indian Navy. Malaysian Airlines Flight 370, a Boeing 777 airliner with 239 persons on board, disappeared on 8 March 2014 and is alleged to have crashed into the southeastern Indian Ocean about 2,000 km (1,200 mi) from the coast of southwest Western Australia. Despite an extensive search, the whereabouts of the remains of the aircraft are unknown. The sea lanes in the Indian Ocean are considered among the most strategically important in the world with more than 80 percent of the world's seaborne trade in oil transits through Indian Ocean and its vital choke points, with 40 percent passing through the Strait of Hormuz, 35 percent through the Strait of Malacca and 8 percent through the Bab el-Mandab Strait. The Indian Ocean provides major sea routes connecting the Middle East, Africa, and East Asia with Europe and the Americas. It carries a particularly heavy traffic of petroleum and petroleum products from the oil fields of the Persian Gulf and Indonesia. Large reserves of hydrocarbons are being tapped in the offshore areas of Saudi Arabia, Iran, India, and Western Australia. An estimated 40% of the world's offshore oil production comes from the Indian Ocean. Beach sands rich in heavy minerals, and offshore placer deposits are actively exploited by bordering countries, particularly India, Pakistan, South Africa, Indonesia, Sri Lanka, and Thailand. Chinese companies have made investments in several Indian Ocean ports, including Gwadar, Hambantota, Colombo and Sonadia. This has sparked a debate about the strategic implications of these investments. ^ a b c d e f g h i "U.S. Navy Oceanographer". Archived from the original on 2 August 2001. Retrieved 4 August 2001. ^ a b Harper, Douglas. "Indian Ocean". Online Etymology Dictionary. Retrieved 18 January 2011. ^ Harper, Douglas. "India". Online Etymology Dictionary. Retrieved 8 July 2018. ^ Parker, Laura (4 April 2014). "Plane Search Shows World's Oceans Are Full of Trash". National Geographic News. Retrieved 30 December 2018. ^ "New marine life found in deep sea vents". BBC News. 15 December 2016. Retrieved 15 December 2016. ^ Anonymous (1912). Periplus of the Erythraean Sea. Translated by Schoff, Wilfred Harvey. ^ DeSilva-Ranasinghe, Sergei (2011-03-02). "Why the Indian Ocean Matters". The Diplomat. Alpers, E.A. (2013). The Indian Ocean in World History. Oxford University Press. ISBN 978-0-19-533787-7. Lay summary. Arnsdorf, Isaac (22 July 2013). "West Africa Pirates Seen Threatening Oil and Shipping". Bloomberg. Retrieved 23 July 2013. Beaujard, P.; Fee, S. (2005). "The Indian Ocean in Eurasian and African world-systems before the sixteenth century". Journal of World History. 16 (4): 411–465. doi:10.1353/jwh.2006.0014. JSTOR 20079346. Retrieved 3 February 2019. Brewster, D. (2014). "Beyond the String of Pearls: Is there really a Security Dilemma in the Indian Ocean?". Journal of the Indian Ocean Region. 10 (2): 133–149. doi:10.1080/19480881.2014.922350. Retrieved 25 July 2015. Cabrero, Ferran (2004). "Cultures del món: El desafiament de la diversitat" (PDF) (in Portuguese). UNESCO. pp. 32–38 (Els maldivians: Mariners llegedaris). Archived from the original (PDF) on 26 December 2016. Retrieved 25 July 2015. Carton, J. A.; Chepurin, G.; Cao, X. (2000). "A simple ocean data assimilation analysis of the global upper ocean 1950–95. Part II: Results" (PDF). Journal of Physical Oceanography. 30 (2): 311–326. doi:10.1175/1520-0485(2000)030<0311:ASODAA>2.0.CO;2. Retrieved 23 March 2019. Chatterjee, S.; Goswami, A.; Scotese, C. R. (2013). "The longest voyage: tectonic, magmatic, and paleoclimatic evolution of the Indian plate during its northward flight from Gondwana to Asia". Gondwana Research. 23 (1): 238–267. Bibcode:2013GondR..23..238C. doi:10.1016/j.gr.2012.07.001. "Oceans: Indian Ocean". CIA – The World Factbook. 2015. Retrieved 25 July 2015. Dreyer, E.L. (2007). Zheng He: China and the Oceans in the Early Ming Dynasty, 1405–1433. New York: Pearson Longman. p. 1. Eakins, B.W. ; Sharman, G.F. (2010). "Volumes of the World's Oceans from ETOPO1". Boulder, CO: NOAA National Geophysical Data Center. Retrieved 25 July 2015. El-Abbadi, M. (2000). "The greatest emporium in the inhabited world". Coastal management sourcebooks 2. Paris: UNESCO. Fitzpatrick, S.; Callaghan, R. (2009). "Seafaring simulations and the origin of prehistoric settlers to Madagascar" (PDF). In Clark, G.R. ; O'Connor, S.; Leach, B.F. Islands of Inquiry: Colonisation, Seafaring and the Archaeology of Maritime Landscapes. ANU E Press. pp. 47–58. ISBN 978-1-921313-90-5. Retrieved 25 July 2015. "Tuna fisheries and utilization". Food and Agriculture Organization of the United Nations. 2016. Retrieved 29 January 2016. Forbes, A. (1981). "Southern Arabia and the Islamicisation of the Central Indian Ocean Archipelagoes" (PDF). Archipel. 21 (21): 55–92. doi:10.3406/arch.1981.1638. Retrieved 23 February 2019. Han, W.; McCreary Jr, J.P. (2001). "Modelling salinity distributions in the Indian Ocean" (PDF). Journal of Geophysical Research. 106 (C1): 859–877 (see Introduction, p. 859). Bibcode:2001JGR...106..859H. doi:10.1029/2000jc000316. Retrieved 25 July 2015. "Limits of Oceans and Seas" (PDF). Nature. International Hydrographic Organization. 172 (4376): 484. 1953. Bibcode:1953Natur.172R.484.. doi:10.1038/172484b0. Retrieved 25 July 2015. "The Indian Ocean and its sub-divisions". International Hydrographic Organization, Special Publication N°23. 2002. Retrieved 25 July 2015. LaViolette, A. (2008). "Swahili cosmopolitanism in Africa and the Indian Ocean world, AD 600–1500". Archaeologies. 4 (1): 24–49. doi:10.1007/s11759-008-9064-x. Retrieved 23 February 2019. MacLeod, Calum; Winter, Michael; Gray, Allison (8 March 2014). "Beijing-bound flight from Malaysia missing". USA Today. Retrieved 31 December 2018. Müller, R. D.; Royer, J. Y.; Lawver, L. A. (1993). "Revised plate motions relative to the hotspots from combined Atlantic and Indian Ocean hotspot tracks" (PDF). Geology. 21 (3): 275–278 (Fig. 1, p. 275). Bibcode:1993Geo....21..275D. doi:10.1130/0091-7613(1993)021<0275:rpmrtt>2.3.co;2. Archived from the original (PDF) on 26 July 2015. Retrieved 25 July 2015. Rais, R.B. (1986). The Indian Ocean and the Superpowers. Routledge. ISBN 978-0-7099-4241-2. Romero-Frias, Xavier (2016). "Rules for Maldivian Trading Ships Travelling Abroad (1925) and a Sojourn in Southern Ceylon". Politeja. 40: 69–84. Retrieved 22 June 2017. Roxy, M.K. (2016). "A reduction in marine primary productivity driven by rapid warming over the tropical Indian Ocean" (PDF). Geophysical Research Letters. 43 (2): 826–833. Bibcode:2016GeoRL..43..826R. doi:10.1002/2015GL066979. Roxy, Mathew Koll; Ritika, Kapoor; Terray, Pascal; Masson, Sébastien (2014). "The Curious Case of Indian Ocean Warming" (PDF). Journal of Climate. 27 (22): 8501–8509. Bibcode:2014JCli...27.8501R. doi:10.1175/JCLI-D-14-00471.1. ISSN 0894-8755. Retrieved 23 February 2019. Schott, F. A.; Xie, S. P.; McCreary, J. P. (2009). "Indian Ocean circulation and climate variability" (PDF). Reviews of Geophysics. 47 (1): RG1002. Bibcode:2009RvGeo..47.1002S. doi:10.1029/2007RG000245. Retrieved 3 March 2019. Shankar, D.; Vinayachandran, P. N.; Unnikrishnan, A. S. (2002). "The monsoon currents in the north Indian Ocean" (PDF). Progress in Oceanography. 52 (1): 63–120. Bibcode:2002PrOce..52...63S. CiteSeerX 10.1.1.389.4733. doi:10.1016/S0079-6611(02)00024-1. Retrieved 28 December 2018. Stow, D. A. V. (2006). Oceans: an illustrated reference. Chicago: University of Chicago Press. p. 127 (Map of Indian Ocean). ISBN 978-0-226-77664-4. Telford, J.; Cosgrave, J. (2006). Joint evaluation of the international response to the Indian Ocean tsunami: Synthesis report (PDF) (Report). Tsunami Evaluation Coalition (TEC). Retrieved 30 December 2018. Van Sebille, E.; England, M. H.; Froyland, G. (2012). "Origin, dynamics and evolution of ocean garbage patches from observed surface drifters". Environmental Research Letters. 7 (4): 044040. Bibcode:2012ERL.....7d4040V. doi:10.1088/1748-9326/7/4/044040. Vörösmarty, C. J.; Fekete, B. M.; Meybeck, M.; Lammers, R. B. (2000). "Global system of rivers: Its role in organizing continental land mass and defining land‐to‐ocean linkages" (PDF). Global Biogeochemical Cycles. 14 (2): 599–621. doi:10.1029/1999GB900092. Retrieved 13 April 2019. Look up indian ocean in Wiktionary, the free dictionary. "The Indian Ocean in World History" (Flash). Sultan Qaboos Cultural Center. Retrieved 25 July 2015. "The Indian Ocean Trade: A Classroom Simulation" (PDF). African Studies Center, Boston University. Retrieved 25 July 2015. "Indian Ocean" . Encyclopædia Britannica (11th ed.). 1911.